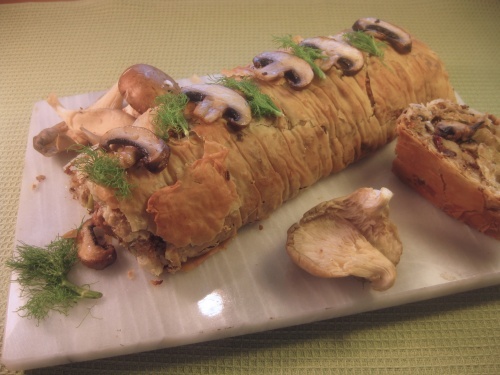 This is a tasty savoury strudel, the filling can be either button mushrooms or a mixture of different ones. You can omit the fennel if you don’t like it, and it can be a vegetarian dish if you leave out the bacon. You will need a baking tray. In a large frying pan melt the butter with the oil and lightly fry the bacon, onion, garlic, leek and fennel and fry for a few minutes. Empty into a bowl and season with a little salt. Heat the oven to Gas 4 / 180C. Grease a baking tray. Slice the mushrooms. Melt the 1oz butter in the frying pan and fry the mushrooms for about three minutes. Put a few slices on one side for decoration. Add the tomatoes and parsley to the pan and mix the filling ingredients together. Melt the 2oz butter with the oil. Place a sheet of pastry on a pastry board, brush wih the melted butter and layer 4 more sheets of pastry brushed with butter, reserving a little butter. Cut to 25cm (10in) in length. Spread the filling down the centre of the pastry, covering about two thirds of the width. Roll up from the long side like a swiss roll. Transfer to the baking tray and brush with the reserved butter. Bake for about 35 minutes or until the pastry is golden brown. Serve hot with either a green salad or a green vegetable. If you have any left over, warm it in the oven for a few minutes.